Wow! Realising how long it's been since I've posted one of these. I think it's safe to safe I've finished my "stash". I'm so low on products, I've resorted to going to Boots again. I know, I know, I should have learned my lesson after my last experience shopping for hair products there. Nevertheless, I think I've successfully shed my product junkie ways for the time being, at least when it comes to hair products. From now on, my posts with mini reviews will be entitled "Empties" and the date or the number of the post. Getting into the products, unfortunately, this list is probably going to be shorter than it is in reality, because I didn't keep any of the bottles to remind me. Curls Blueberry Curl Control Paste: it's quite similar to the Passionfruit one. I like it, but I think I'll stick to Passionfruit since it's cheaper and performs slightly better, plus I prefer the passionfruit fragrance. DevaCurl Decadence One Condition: Just putting it out there, I love this stuff. It's such an amazing conditioner. I use it as a rinse out and as a deep conditioner. I'm able to detangle with it also. My sister doesn't care for it too much, so just goes to show, what works for some people, doesn't necessarily work for others. Definitely a repurchase. I would have done a full review but I finished the bottle weeks ago. Eco Styler Olive Oil Gel: check out a review of sorts on why I'm no longer feeling Eco Styler gel here. Herbal Essences Honey I'm Strong Strengthening Conditioner: check out the full review here. ORS Olive Oil with Moringa Oil Strand Strengthening Styling Gelee: check out the full review here. Ouidad Ultra-Nourishing Cleansing Oil: This is a good shampoo and gets my clean without stripping it. Although it's only 8.5oz, I had it for nearly a year, using for at least one wash a week. The only thing that makes me reluctant to repurchase is the price. I've used cheaper shampoos that perform similarly such as Shea Moisture Raw Shea Butter Moisture Retention Shampoo, which I used for a few years. 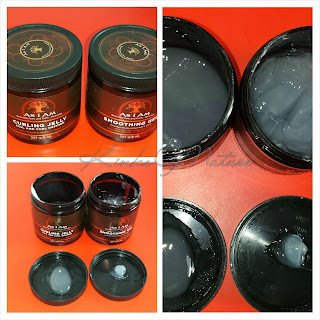 WetLine Xtreme Gel: check out my first mini review on the gel here. I'm going to do a full review on this gel eventually. Thank you, sis, for my new jar. For my UK people, this is now available in Beauty by Zara. That's all I can remember at the moment. Next time, I'll keep track. Just a quick note: when I was Googling the Shea Moisture full product name, I saw that Shea Moisture is now available in Boots and Superdrug!